So, as most of you know, this past Christmas my wonderful husband bought me a Kitchenaid Mixer, which I was quite excited about...much to the surprise of my family. While I have never been known to spend a lot of time in the kitchen, cooking and baking is something I have been wanting to learn and enjoy. While registering for wedding gifts, my then soon-to-be sister-in-law (Lisa) even asked Ronnie, "Why do you guys have so much kitchen stuff on your list? Michelle doesn't cook." And she was right! Even Ronnie was wondering why we needed all the "gadgets" we were registering for. Shortly after our shipment arrived in Ecuador with all of our wedding gifts (and all those fun gadgets) I began to put them to use. After all, I had to prove Ronnie wrong...and I did. He can testify on my behalf that I have used EVERY gadget, platter, baking sheet and kitchen related gift we received! :) I even proved to him the usefulness of the cake/cupcake caddy I had to have when we took cupcakes to the Marine house for the Super Bowl Party. 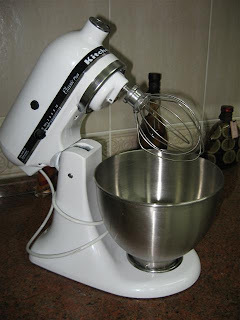 Ok, back to the Kitchenaid. I guess proving that I will actually use all of these fun new "toys" got me the mixer. In the last 3 months I have been trying to find any excuse to use it. 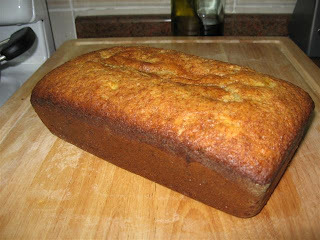 I've made mashed potatoes, frostings, cakes, truffles and today I decided to make my FIRST bread! 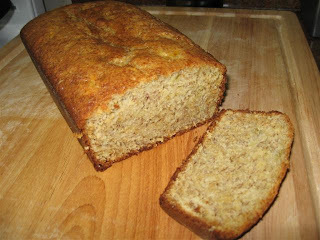 (Ok, we're talking a "quick" bread...no yeast needed.) 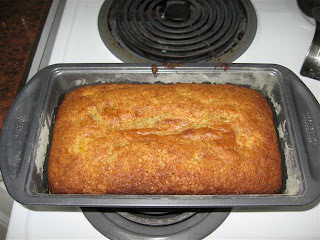 I had some very ripe bananas that were ready to be trashed when I decided to find a recipe for banana bread. It seemed simple enough so I got out the mixer and away I went. I was quite nervous being that this was the first non-boxed "bread" I've ever made. Especially with everyone telling me how difficult t is to bake here because of the high altitude. After only 20 minutes the house smelled fabulous...what I hoped was a good sign. And success!! After letting it cool, I popped it out of the pan and cut into it. Perfect! :) I'm so proud. I just wish there were someone here to share it with. I know I won't eat all of it so I'll probably take it into work. Don't worry Ronnie, I'll make one just for you when you come home. 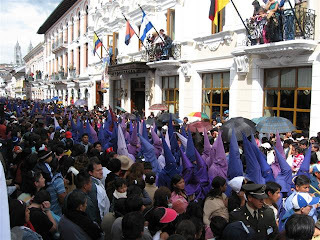 "The amazing churches of Quito’s World Heritage-listed Old Town will open their doors and the hearts of the faithful for the ceremonies of Easter Week here in the Ecuadorian capital. The finest of the world’s religious music artists will fill these temples with songs of praise. The tables of Quito’s restaurants and homes will be brimming with fine food – in particular the incredible fanesca soup. 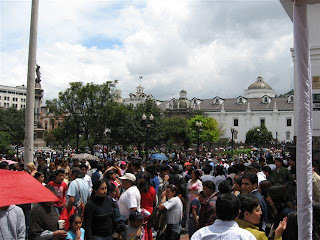 It’s a great time to come to Quito! The churches, plazas and streets of the historic centre will be the city’s stage where the greatest celebration in the Christian calendar will unfold. 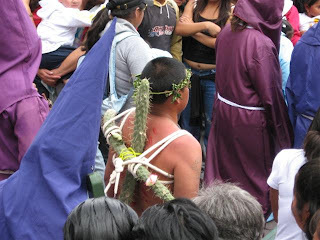 These are of great religious importance to the faithful of the city, but they also express strong cultural elements that are very particular to this Andean city. 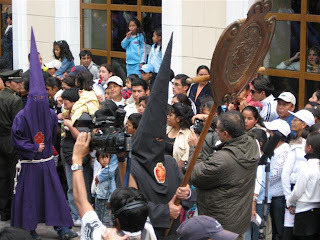 The "Arrastre de Caudas" or Dragging of the Flag ceremony hails back to traditions of the Roman Empire which today only takes place in Quito and Seville in Spain. 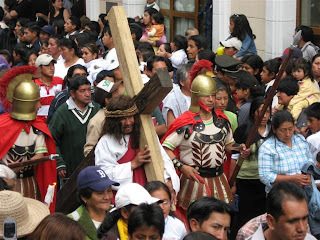 The procession of Jesús del Gran Poder (Jesus the Almighty), in which tens of thousands of citizens take part, is a captivating spectacle of the city’s faith which completely transforms the historic centre on Good Friday." 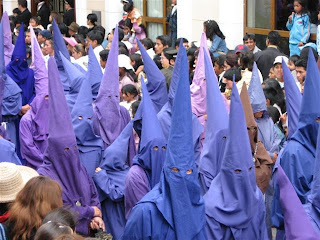 So, on Good Friday, a friend of mine from work invited me to go to the processions with her family. 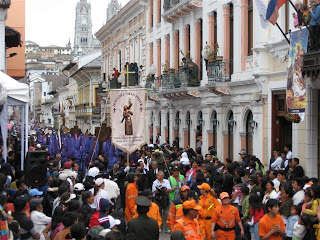 We took a taxi into Old Quito then walked to the square where the procession would pass. 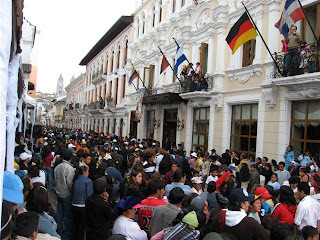 We had reservations at La Plaza Grande, a very nice hotel right on the path of the procession. We paid $20 for lunch (the traditional fanesca soup, empandas w/ cheese and a glass of wine) then after our meal we were taken across the street to a covered seating area. Soft drinks and coffee were served while we sat out of the sun and away from the crowds. That alone was well worth the $20! The procession begins at midday to recall the hour which Pontius Pilate condemned Jesus to death. 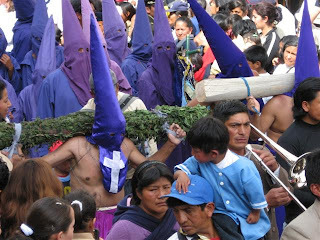 The hooded cucuruchos and the robed Verónicas are the traditional figures who accompany Jesús del Gran Poder (Jesus Almighty) and the Virgen Dolorosa (Virgin of Sorrows) on the procession which starts and ends at the San Francisco church and which passes through a large swathe of the historical centre. 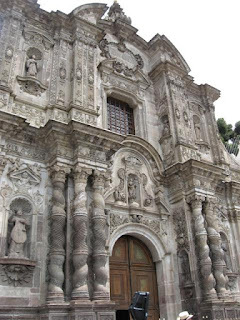 -Old Quito has many hitorical churches. 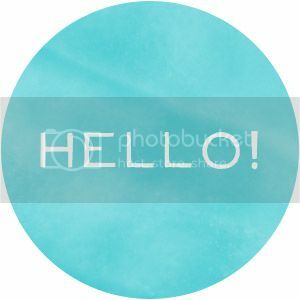 This was my first time in the area and we didn't have time to really visit the churches, but when Ronnie comes back I look forwarding to spending a day touring all of the history in this region of the city. -And this is why those seats were SO great. - The procession would come from way down this street. -After waiting and waiting, it finally reached us. 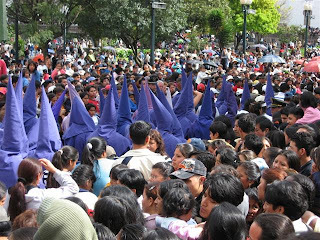 -The cucuruchos symbolize the penitents who, dressed in purple, show their repentance and their will to change. 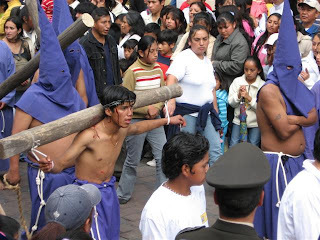 There are also many penitents carrying crosses, or with their feet chained, or even with real thorns wrapped around their heads. -The Verónicas recall the woman who came to Jesus as He carried the cross, and who wiped His face full of sweat and blood (the origin of the Shroud of Turin). 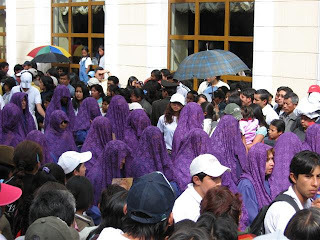 In Quito, the Verónicas also wear purple, their faces hidden by black shrouds. I hope you all had a very happy and blessed Easter!